Touch Of Belle : 2014 Blogger Challenge! Book Review! From the start this story gripped me, I just couldn't put it down, every second I had I was reading, eager to see what happened next. This really is what you miss from fairytales as a child, of course what happens to Sandy Shortt (who, by the way is very very tall) will never ever happen to any one of us in real life but hey! that's what fairytales are for! 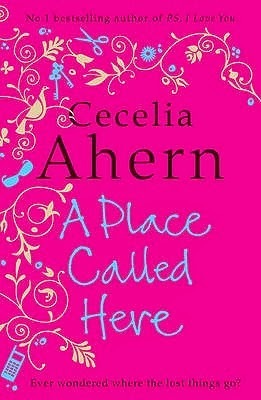 I was very well entertained and my love for this book caused me to go out and buy all the other Cecelia Ahern books too, The way the story is written is fantastic it has the perfect amount of twists and entertaining corners and yes, it makes me think of "a place called here" everytime I lose stuff ... especially socks! Her parents, concerned for her wellbeing, persuade her to see a psychiatrist about her obsession with finding things, a man named Gregory who soon becomes a romantic interest. Her career is shaped by this obsession; she starts off working for the Garda, the Irish Police force, before setting up her own detective agency that specialises in finding missing people. One day, a man named Jack Ruttle employs Sandy to search for his missing brother, Donal, but on her search for him Sandy disappears too. Jack begins to search for her, discovering more than he bargained for, but it is nothing compared to what Sandy finds, the place where all things lost are found, a place called here. I would definatly recommend reading this or any of the books written by Cecelia Ahern, Have you read any of her books before? I've never heard of this author, but I've added this book to my to-read list on Goodreads. Thanks for the review!